and substituting hand function in individuals with upper extremity amputation/paralysis. The talocrural joint is formed between the distal tibia-fibula and the talus, and is commonly known as the ankle joint. The distal and inferior aspect of the tibia – known as the plafond – is connected to the fibula via tibiofibular ligaments forming a strong mortise which articulates with the talar dome distally. It is a hinge joint and allows for dorsiflexion and plantarflexion movements in the sagittal plane. It is also known as the talocalcaneal joint and is formed between the talus and calcaneus. The talus has three facets (anterior, middle and posterior) which articulate inferiorly with the calcaneus. Also known as transverse tarsal joints or Chopart’s joint. It is an S-shaped joint when viewed from above and consists of two joints – the talonavicular joint and calcaneocuboid joint. 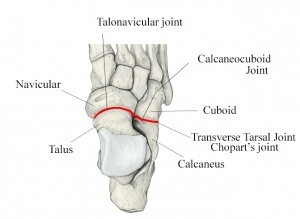 Talonavicular (TN) Joint - Formed between the anterior talar head and the concavity on the navicular. It does not have its own capsule, but rather shares one with the two anterior talocalcaneal articulations. 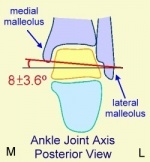 Calcaneocuboid (CC) Joint - Formed between the anterior facet of the calcaneus and the posterior cuboid. Both articulating surfaces present a convex and concave surface, with the joint being convex vertically and concave transversely. Very little movement occurs at this joint. The MTP joints are formed between the metatarsal heads and the corresponding bases of the proximal phalanx. The interphalangeal joints of the toes are formed between the phalanges of the toes. Each toe has proximal and distal IP joints except for the great toe which only has one IP joint. The axis of the subtalar joint lies about 42o superiorly to the sagittal plane and about 16 to 23o medial to the transverse plane. The literature presents vast ranges of subtalar motion ranging from 5 to 65o. The average ROM for pronation is 5o and 20o for supination. Inversion and eversion ROM has been identified as 30o and 18o, respectively. Total inversion-eversion motion is about 2:1 or 3:2 ratio of inversion-to-eversion movement. The midtarsal joint rotates at two axes due to its anatomy, making its motion complex. Longitudinal axis (image 'A' below) lies about 15o superior to the horizontal plane and about 10o medial to longitudinal plane. The oblique axis (image 'B' below) lies about 52o superior to the horizontal plane and 57o from midline. The longitudinal axis is close to the subtalar joint axis and the oblique axis is similar to the talocrural joint axis. MT Joint Locking – An important function of the foot is propulsion of weight during stance phase. This function is made possible by the MT joint locking and unlocking. During heel strike, the foot needs to be flexible in order to adjust to the surface and the MT joint unlocks to provide this flexibility. Later in the gait cycle, the foot then needs to act as a rigid lever to propel the weight of the body forward which is made possible by MT joint locking. During pronation/eversion of the foot, the axis of the TN and CC joints are parallel to each other, making it easier for them to independently move and unlock the MT joint. The axes cross each other during supination/inversion which locks the MT joint making it difficult to move. Blackwood et al concluded in the study that there is increased forefoot movement when the calcaneus is everted. This is consistent with the MT joint locking mechanism. The MTP joints are biaxial and move in sagittal and transverse planes. MTP joints have a greater sagittal plane movement and very little transverse plane movement. At the MTP joints, hyperextension is about 90o and flexion is about 30 to 50o. IP joints are hinge joints which limit motion in one direction. 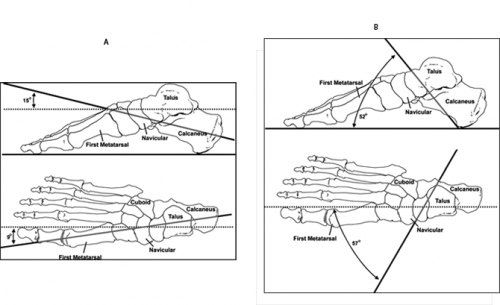 Talocrural Joint – Talus rolls within the mortise during dorsiflexion and plantarflexion. During dorsiflexion, the talus rolls anteriorly and it glides posteriorly. While with plantarflexion, talus rolls posteriorly and glides anteriorly. Midtarsal Joint – For Talonavicular joint, the concave navicular moves on convex talus and hence the roll and glide is in the same direction of movement. The calcaneocuboid joint is a saddle joint so the direction changes depending on the movement. During flexion-extension, the cuboid is concave and the calcaneus is convex; hence, the roll and glide occurs in the same direction as the talonavicular joint. During abduction-adduction, however, the cuboid is convex and calcaneus is concave, and therefore the roll and glide occurs in the opposite direction. Lisfranc Joint – Secondary to bony and ligamentous anatomy of the complex, its primary role is stability of the midfoot and has very little movement. It has three distinct arches and the main stabilizing structure of TMT joint is a Y-shaped ligament known as Lisfranc’s ligament. MTP and IP Joints – Glide and roll is in the same direction as the movement for the MTP joints as the concave base of the phalanx moves on the convex head of the metatarsal. The same is true for the IP joints, where glide and roll is in the same direction as the concave distal phalanx moves on the convex proximal phalanx. Calcaneocuboid joint Full supination Midway between extreme ROM Limitation of dorsiflexion, plantarflexion, adduction and internal rotation. Distal - Cuboid is concave during flexion-extension. Proximal - Calcaneus is convex during flexion-extension. As discussed above with MT joint locking, the transition of foot from pronation to supination is an important function that assists in adapting to uneven terrain and acting as a rigid lever during push off. During pronation, MT joint unlocks providing flexibility of the foot and assists in maintaining balance. And during supination, MT joint locks providing rigidity of the foot and maximizing stability. If the foot stuck pronated, this would lead to hypermobility of the midfoot and place greater demand on the neuromuscular structures that stabilize the foot and maintain upright stance. Whereas if the foot is stuck supinated, the midfoot would be hypomobile, which would compromise the ability of the foot to adjust to the terrain and increase demand on surrounding structures to maintain postural stability and balance. Cote et alconcluded that postural stability is affected by foot position im both static and dynamic conditions. Chain reactions occur secondary to positioning of the foot. The arches of foot provide functions of force absorption, base of support and acts as a rigid lever during gait propulsion. The medial longitudinal arch, lateral longitudinal arch and transverse arch are the 3 arches that compromises arches of foot. Medial Longitudinal Arch (MLA) – It is the longest and highest of all the arches. Bony components of MLA include calcaneus, talus, navicular, the three cuneiform bones and first 3 metatarsal. The arch consists of two pillar: anterior and posterior pillars. Anterior pillar consists of head of first 3 metatarsal heads whereas posterior pillar consists of tuberosity of calcaneus. Plantar aponeurosis forms the supporting beam connecting the two pillars. Apex of the MLA is superior articular surface of talus. In addition to plantar aponeurosis the MLA is also supported by spring ligament and deltoid ligament. Tibialis anterior and posterior muscles play an important role in raising the medial border of the arch, whereas flexor hallucis longus acts as bowstring. Lateral Longitudinal Arch (LLA) – It is the lowest arch and compromises of calcaneus, cuboid and fourth & fifth metatarsal as its bony component. Like MLA the posterior pillar consists of tuberosity of calcaneus whereas the anterior pillar is formed by metatarsal heads of 4th and 5th metatarsals. Plantar aponeurosis, and long & short plantar ligaments provide support for LLA. Peroneus longus tendon plays an important role in maintaining the lateral border of the arch. Transverse Arch – It is concave in non-weight bearing which runs medial to lateral in midtarsal and tarsometatarsal area. 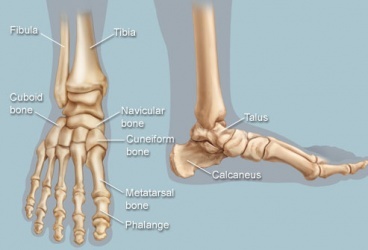 The bony component of the arch consists of metatarsal heads, cuboids and 3 cuneiform bones. The medial and lateral pillars of the arch is formed by medial and lateral longitudinal arch respectively. The arch is maintained by posterior tibialis tendon and peroneus longus tendon which cross the plantar surface from medial to lateral and lateral to medial respectively. Windlass Mechanism of foot – The plantar aponeurosis acts similarly as windlass mechanism. Windlass is typically a horizontal cylinder that rotates with a crank or belt on a chain or rope to pull a heavy objects. The common use of windlass is seen in pulling the anchor of the ship known as anchor windlass. This mechanism can be seen in foot. When the MTP joints are hyperextended, the plantar aponeurosis becomes taut as it is wrapped around the MTP joints. This actions brings the metatarsal and tarsal bones together converting it into a rigid structure and eventually causing the longitudinal arches to rise. This function is important in providing a rigid lever for gait propulsion during push off. The foot requires sufficient mobility and stability for all of its functions. Mobility is necessary for absorbing the ground reaction force of the body. Subtalar pronation has a shock absorbing effect during initial heel contact. 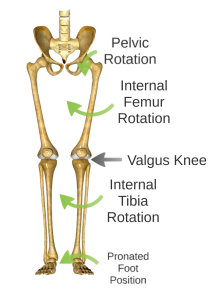 Pronation is also necessary to make rotation of the leg possible and to absorb the impact of this rotation. Subtalar pronation plays a role in shock absorption through eccentric control of the supinators. On the other side, the joint of Chopart becomes unlocked so that the forefoot can stay loose and flexible. In midstance, the foot needs mobility to adapt to variation in surfaces. Foot stability is necessary to provide a stable base for the body. The foot needs the capacity to bear body weight and act as a stable lever to propel the body in forward. This function requires pronation control of the subtalar joint. In the transition from midstance to propulsion phase, the mechanisms often fail. The transition from eversion to inversion is facilitated by the tibialis posterior muscle. The muscle is stretched like a spring and potential energy is stored. At the end of the midstance, the muscle passes from eccentric to concentric work and the energy is released. The tibialis posterior muscle then causes abduction and dorsiflexion of the caput tali in which the hindquarter everted. At the same time, the muscle peroneus longus, at the end of the midstance, will draw the forefoot with a plantar flexion of the first toe. 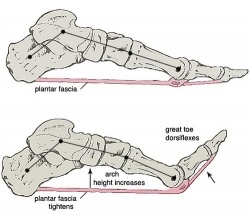 This is how the forefoot becomes stable. When the forefoot moves in the propulsion phase, the windlass phenomena starts. When the dorsiflexion of the metatarsophalangal joints begins the plantar fascia undergoes stress, so the os calcaneus becomes vertical and teared in inversion. Like this, the hindquarter rests in inversion in the unwinding of the forefoot. When there are some abnormalities in the normal gait cycle of functions of the body, some functional ortheses can be used. This orthese have the capacity to correct the biomechanical function of the foot. In contrast, insoles only support the arch of the foot. Reduced or limited mobility in the lower limbs can be caused by a articular limitation. In these cases some classic mobilizations or mobilizations according to manual therapy can be designated. When the cause is a muscle shortening some stretching can be designated. Also, good (running) shoes are indicated. ↑ 5.0 5.1 5.2 Lundberg A, Goldie I, Kalin B, Selvik G. Kinematics of the ankle/foot complex: Plantarflexion and dorsiflexion. Foot and Ankle 9(4):194–200, 1989. ↑ 9.0 9.1 Stagni R, Leardini A, O'Connor JJ, Giannini S. Role of passive structures in the mobility and stability of the human subtalar joint: a literature review. Foot andankle international. 2003 May 1;24(5):402-9. ↑ 15.0 15.1 15.2 15.3 15.4 15.5 15.6 15.7 15.8 15.9 Cote KP, Brunet II ME, Gansneder BM, Shultz SJ. Effects of pronated and supinated foot postures on static and dynamic postural stability. Journal of athletic training. 2005 Jan 1;40(1):41. ↑ 16.0 16.1 16.2 16.3 16.4 16.5 16.6 16.7 16.8 Langer PS, et al. A practical manual of clinical electrodynography. 2nd ed. Deer Park: The Langer Foundation for Biomechanics and Sports Medicine Research, 1989. ↑ Shephard R.J. and Taunton J.E., Foot and Ankle in Sport and exercise, Basel, 1987. (p.30-38).